At the NH High Tech Council’s Product of the Year ceremony are|! !| from left: Sgt. Steven Bolduc of the Exeter Police Department Special Emergency Response Team|! !| (SERT); Michael Helfich of Blueforce Development; Ned Dazell of Wilcox; Jim Teetzel|! !| CEO of Wilcox; Dave Kent; Tim West; and Roger Desrosiers of Wilcox. Bolduc and Desrosiers are wearing Wilcox’s Scott Hybrid Patriot 5510 backpack respirator system. 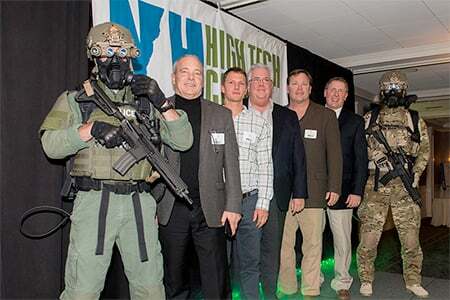 Wilcox Industries’ backpack respirator system for military and first responders took home the top prize at this year’s NH High Tech Council Product of the Year ceremony. Newington-based Wilcox’s Scott Hybrid Patriot 5510 is an update of a system originally designed after Sept. 11, 2001. The most recent, more lightweight version features Bluetooth technology that monitors location and air levels. It is used by elite tactical organizations including Navy Seals, military explosive disposal units, fire departments, the presidential guard and the Secret Service. As first-place winner, Wilcox was awarded a hand-cut crystal trophy, designed by Pepi Herrmann Crystal of Gilford. The company will also be prominently featured in a display at the Interstate 93 South Welcome Center in Hooksett. • Manchester-based Corflex Technologies’ The Contender post-op elbow brace, a medical device for use by patients following reconstruction surgery. • Windham-based Contour Designs’ RollerMouse Free3, an ergonomic computer workstations that features, a rollerbar mechanism that replaces the traditional computer mouse. • Manchester-based Jewell Instruments; JMA-165 accelerometer, a sensor used for rail applications that provides feedback on the performance and control of passenger trains. • Milford-based NextMove Technologies’ LinkAlign-60EBP, a power-over-Ethernet antenna positioner designed for use with microwave line of sight systems. • Laconia-based Orion Entrance Control Systems’ Optical Barrier Swing Glass-Wave, a turnstile system for use in government buildings, corporate offices and other areas where secure admission is a requirement. a 7-year-old company based in Laconia — dropped out of the competition because it was unable to attend the event.